True or false: Your teeth are healthy because you do not feel pain or discomfort? True or False: Your teeth are healthy because they look nice? Just because you do not feel pain or discomfort does not mean that your teeth are healthy. Not all symptoms cause you pain and everyone’s mouths react differently. It is important to get regular check-ups because your dentist and hygienist can identify any unhealthy signs and catch them before they get worst. Don’t wait until you feel pain before you go see your dentist, see your dentist because you don’t want to feel pain! 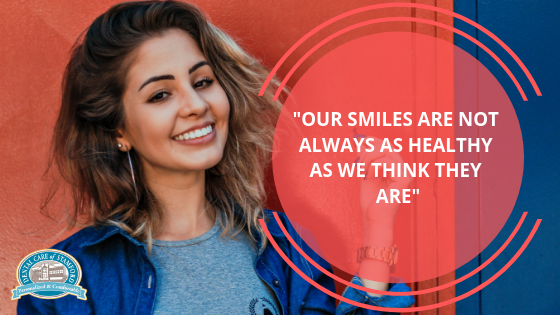 Although having a good-looking smile is a good thing, it does not always mean your teeth are healthy. There are lots of things that go on in your mouth and appearance is not an indication for healthy teeth. Cavities are not always visible, especially in an early stage. Getting x-rays of your teeth at least once a year is important because x-rays can find complications that can’t be seen on the service – hence why your teeth still look nice. Unfortunately, if those complications are left untreated it will grow and eventually reach the service and by that time it will be harder to save your tooth. We should never assume that our teeth are healthy just because we brush our teeth. Do not be ashamed of bad breath or be embarrassed about it. It is your body’s way of telling you that there is something not right. It is important to tell your dentist and ask them more about it. It is important to always floss every day, especially after eating food. But if you are constantly pulling out food from your teeth you may have a cavity along the gum line and you should get it looked at right away. Do you feel like your tongue is always coated with a white-chalky film? A healthy-looking tongue is pink and smooth. Your tongue tells a lot about your health, and one of them is the white-coated tongue. Bacteria grow on your tongue and if you do not brush it away it builds up, this could cause you to have bad breath. While brushing your teeth, brush your tongue too; using a tongue scraper is helpful. If it doesn’t go away, talk to your dentist there could be another reason why it’s occurring. Healthy gums do not bleed, if you are experiencing blood while taking care of oral hygiene it means that your gums are inflamed and you should speak with your dentist for more screening. It is commendable if you brush and floss daily, avoid sugary and acidic foods and do not smoke. You are on a good start of a healthy mouth, but without regular dental check-ups, you will not know how actually healthy your mouth is. If you haven’t had your dental visit yet this year: Schedule your appointment today!